Excellent Location: The property is strategically located at the SW corner of I-20 and Harvey Road in Lindale, Texas. It's also about a half mile from the intersection of Toll Loop 49 (a toll road loop around Tyler, Texas) at I-20. Toll Loop 49 from I-20 south has sped up travel time to locations south of Lindale and neighboring Tyler. Ownership: The Lindale Economic Development Corporation (LEDC) completed the park in early 2012 after a three-year construction period. Industries: Manufacturing, distribution, assembly and similar uses. Target Corporation researched Lindale and found it offers an excellent location and transportation network unique to the Lone Star State! That's why it built a 1.6 million-sq.-ft. distribution center--directly adjacent to the Lindale Industrial Park--which distributes product to Target stores all over east Texas and parts of Oklahoma, Arkansas and Louisiana. FedEx Ground built a new distribution center on Industrial Parkway in the Lindale Industrial Park. The facility is more than 163,000 square feet and has replaced two existing facilities nearby. FedEx transferred many positions from the nearby facilities and adds to the workforce as necessary to support increased demand for service in the area. The site was chosen by FedEx because of its ease of access to major highways, its proximity to customer's distribution centers and a strong local community workforce for recruiting employees. The Lindale facility is part of a nationwide network expansion to boost daily package volume capacity and further enhance the speed and service capabilities of the FedEx Ground network. Amenities: This picturesque Industrial Park is situated about 1 mile from popular amenities such as restaurants, gas stations, hotels, retail and commercial stores. 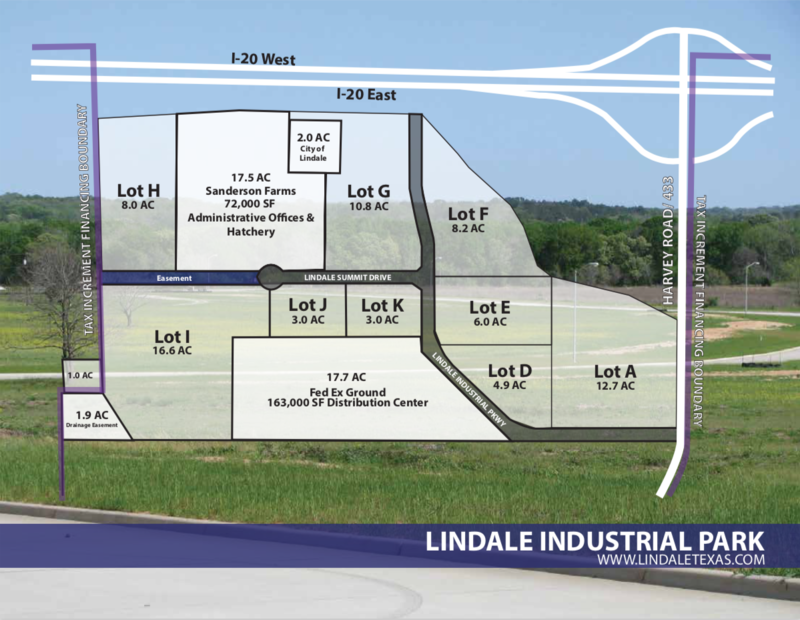 The 137 acres Lindale Business Park, located at the NW corner of I-20 at Harvey Road offers parcels ranging in size from 2 to 20 acres.